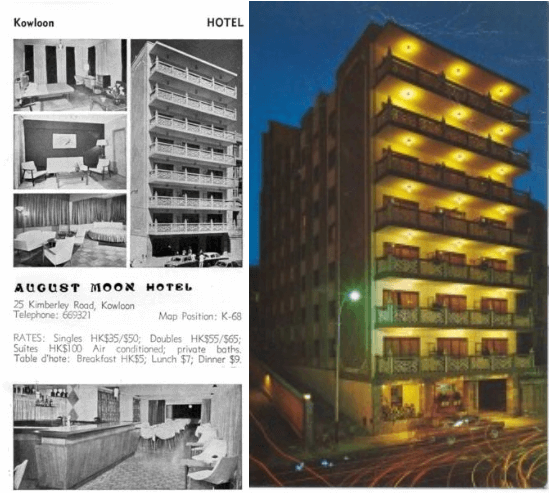 From 1960 to 1977, August Moon Hotel at 25 Kimberley Road in Tsim Sha Tsui was a prominent hotel in Kowloon famous for its unique Chinese architectural stylings in its balconies. The hotel was founded by Barbara Fok Woon-lan (1917-1996), a female pioneer in the HK real estate and hotel industry in the 1960s whose business empire also included two apartment buildings, a movie theater, a restaurant, a private school and an antique and jewelry shop. Barbara’s father Fok Chak-lun (霍澤麟) was in the curio business and operated the Yellow Dragon Shop in Alexandra House in Central. He was also an antique collector and part of his collection became part of the Sir Percival David Foundation collection in London. (Sir David was one of the largest collectors of Chinese ceramics). Barbara worked for her father in the antique business and during the war, she experienced the Japanese bombing of Singapore and Burma in 1941 and lived in Yunnan and Chungking. 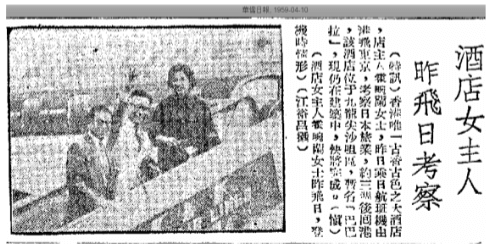 In 1943, Barbara married Louis Fei (費魯伊1914-1979), the youngest of the 4 prominent Fei brothers from Shanghai (An essay by Louis’s niece, the famous singer Barbara Fei mentioned 1939 as the year of the wedding but 1943 is based on Barbara’s biographical entry in Who’s Who). Also known as Fei Tai (費泰), Louis Fei was the younger brother of famous movie director Fei Mu (費穆 1906-1951), architect Fei Kang (費康, d.1942, his wife and business partner was one of the first female architects in China) and pro-Beijing publisher Fei Yimin (費彝民, 1908-1988). After the War, Barbara moved back to HK with his husband and family in 1948 where Fei Lu-yi, a graduate in electrical engineering from Aurora University in Shanghai, followed his older brother into the movie business and eventually took over his Dragon Horse Films (龍馬影業) after his death in 1951. According to his niece Barbara Fei Ming-yi (費明儀, 1932-2017), Louis Fei was fluent in French and 7-8 Chinese dialects and was a handsome and charming fellow but his free spirit clashed with the astute and pragmatic nature of his wife so the marriage ended in divorce in 1957. Louis relocated to Macau where he remarried and directed his first film “Romance in the Boudoir” (香閨春情, starring Miranda Yang aka Hsia Meng or Chinese Audrey Hepburn) in 1960 but sadly he became paralyzed by a stroke in the early 1960s and eventually died at the age of 65 in 1979. After her separation from her husband in 1957, Barbara Fok established Tai Ming Investments the same year and started a string of businesses. In the late 1950s, HK was experiencing a real estate and housing boom and Tsim Sha Tsui had emerged as a prime destination for tourists. In 1957, Henry Fok developed the 8-story Champagne Court on 20 Kimberley Rd which he acquired from the Hotung family in 1954 and Barbara moved into the top floor (the building became notorious after the 1980s but back in the 1950s and 1960s it was very upscale with flats selling at over $30000 each). In the late 1950s, Barbara acquired 25 Kimberley Road on the same road and built an 8-story, 84 room hotel in 1960 which she initially named Barbara Hotel (based on 1959 article above) before settling on August Moon as the hotel’s name. The August Moon Hotel was first managed by Herman W.T. Shiu and later by J. Jorgensen and according to an article in The Economist in 1984, “the manager of the homely August Moon hotel would put up guests in his own house if the hotel’s rooms were full”. The rates at the hotel were very reasonable as shown in the guidebook ad above and as a result, the hotel was popular with visiting tourists, business travelers, war journalists and others. One guest described “August Moon wasn’t as big and flashy as the Ambassador but it was accommodating, nice and clean”. Roger McDivitt, the brother of former Patagonia CEO Kristin McDivitt Tompkins who also worked at Patagonia recalled that “The Moon was a sleepy old dog of a place; they left you alone, so I liked it. The bar was the only air-conditioned room in the place.” In Christmas 1969, a fire broke out in the basement and kitchen of the August Moon Hotel but fortunately no one was injured. In addition to the August Moon Hotel, Barbara Fok also developed the August Moon Apartments on Kimberley Road which was later converted into school in 1968. 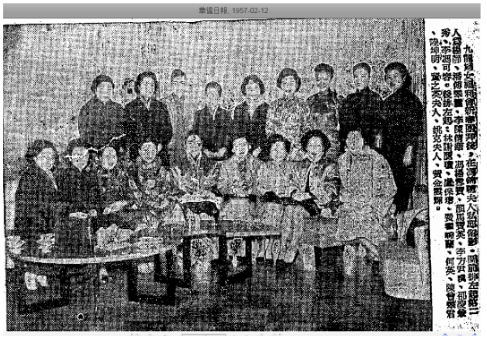 For her involvement in the Tsim Sha Tsui community, she was elected chairperson of the Tsim Sha Tsui Kaifong Association in 1962. In 1963, Barbara Fok developed the 6-story Lan Garden Apartments (蘭苑, named after herself as her Chinese name was Fok Woon-lan) at 373 A&B Prince Edward Road – this building still stands today. 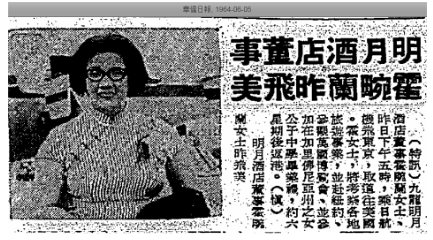 The same year, she also entered other lines of businesses – opening the 1357 seats August Moon Theatre (蘭宮戲院, Chinese name equivalent to Lan’s palace) at 118 Chuen Lung Street in Tsuen Wan in partnership with New Territories cinema mogul Deacon Chiu (see article on Far East Flour Mill) and she was also one of 14 founders of Tsing Hua College at 150 in Boundary Street. She also started Moonlight Café in 1965, which was renamed Honey Cake Shop and later sold to Bali Restaurant in 1967. In August 1972, the listed Imperial Hotel Holdings (operator of nearby Imperial Hotel in TST) controlled by Malaysian businessman Choo Kim San (曹錦山) acquired the August Moon Hotel for HK$10 million worth of shares. The firm which was renamed San Imperial Corporation later the same year got into financial troubles in 1977 and as a result, the August Moon Hotel was sold once again to Cheung Kong and Lee On Realty, which proceeded to re-develop the hotel into Cheung Lee Commercial Building. The August Moon Theatre in Tsuen Wan operated until 1992 and had since been re-developed into Hoover Plaza (豪華廣場). After the sale of the August Moon Hotel, Barbara left HK for the US. Together, Barbara and Louis Fei had 1 son (who tragically died at age of 5) and 2 daughters – Fei Ming-yan (費明恩) and Fei Ming-hao (費明浩). She died in 1996 at the age of 79 and was buried in Forest Lawn Cemetery in Los Angeles. This article was first posted on 5th April 2019. The Hume Pipe (Far East) Ltd – Jock Inglis -The Peninsula Hotel and Clark Gable!